As a Geneva chiropractor and the father of a young athlete, I’m passionate about helping kids stay strong and healthy so they can enjoy their favorite sports. Many of my young patients are teammates of my son, who plays baseball and basketball. They come in with various injuries from those sports and overuse-type conditions. My son, who does a lot of travel sports, deals with excessive training. Chiropractic care has helped him stay healthy and able to be in peak condition to avoid injuries. From gymnasts and cheerleaders to football and basketball players, young athletes put a lot of stress on their bodies that can result in overuse-type conditions. At a young age, a lot of athletes already have back and neck issues. 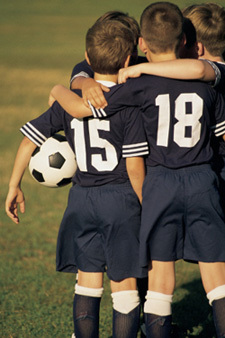 In contact sports, particularly football, they’re hitting each other and falling, which can stress the body. Chiropractic helps by allowing athletes to stay flexible, and it keeps them from having injuries in the future. While not all injuries can be prevented, of course, as long as kids are flexible it does help reduce the chances of becoming injured. So instead of taking weeks off to rehab, young athletes can continue what they’re doing by getting treatments along the way. Chiropractic keeps them on track with their training; otherwise, they need to take time off to mend and heal. Contact us to schedule an appointment.